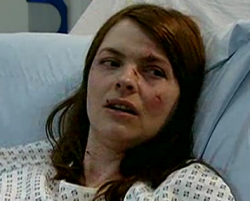 Cornwall ON – Tracy got the crap beat of her on Corrie last week. She then swanned this story to Ken and Deirdre suggesting that her lying and trying to frame an innocent person was because of her kid! Could you imagine someone trying to use their children as an excuse for their cravenly behavior? Really Tracy, what on earth were you thinking? Corrie then went on to finally rid itself of Tony Gordon. The Crazed Scott ex-factory owner sorta weanied out before going up in smoke and flames as the factory burnt around him. My fave, Carla had as much fake bruises and cuts as Tracy, and somehow Roy and Hailey have become a touchingly romantic couple. I kinda wish Gail would’ve been convicted as she’s getting squirrelly as she’s aging on the show. To catch up on the latest on Corrie here in Canuck Land you can catch the episodes nightly on CBC or my fave, the Sunday Omnibus edition. They also show past episodes HERE. So Canadian Corrie fans, what do you think of last week’s episodes and the new opening and closing credits. It feels weird seeing them change after all these years…. Is Tony Gordon really dead? They have not found his body and he (like Zorro falling off a cliff at the end of each show) will find a way out. I think Tony Gordon is dead because the “Forensics” people carried out two bags of remains, one the guy TG shot and the other himself.